SS United States Limited Model Cruise Ship 40"
RMS Titanic Model Cruise Ship 50"
RMS Titanic Limited w/ LED Lights Model Cruise Ship 50"
RMS Titanic Limited Model Cruise Ship 15"
RMS Titanic Model Cruise Ship 32"
Ready To Run Remote Control RMS Titanic Limited 40"
Celebrating the holder of the Blue Riband for the fastest trans-Atlantic crossing by a passenger vessel, the Limited Edition SS United States model cruise ship is built with the finest craftsmanship and demanding attention to every detail, evoking the elegance and grandeur of a bygone era. 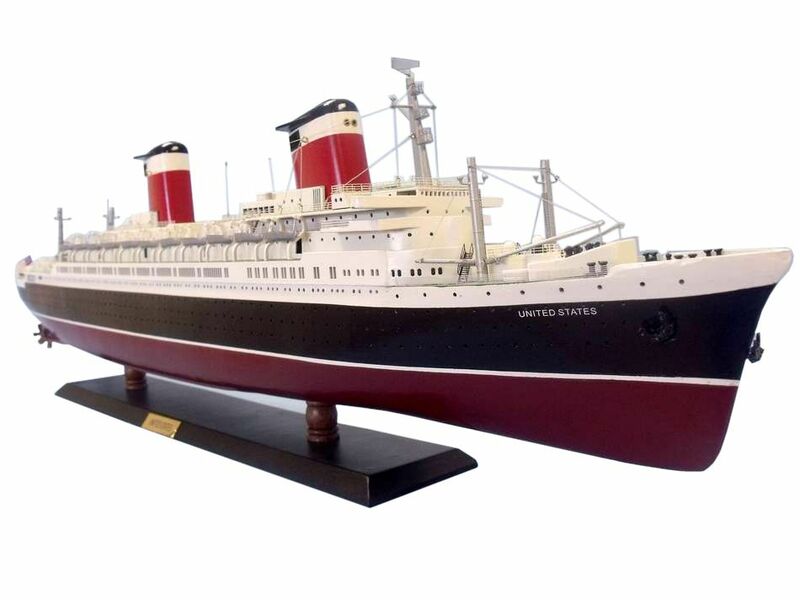 These exquisite Limited Edition cruise ship models of the famous SS United States will carry you back to the heyday of the grand trans-Atlantic ocean liners. SS United States is a passenger liner built in 1952 for the United States Lines and designed to recapture the trans-Atlantic speed record from the British and serve as a possible troop carrier. Built at a cost of $78 million,] the ship remains the largest ocean liner built entirely in the United States, the fastest ocean liner to cross the Atlantic in either direction, and it remains current holder of the Blue Riband, given to the passenger liner crossing the Atlantic Ocean in regular service with the record highest speed. The United States operated in transatlantic passenger service until 1969, and since 1996 has been docked at Pier 82 on the Delaware River in Philadelphia. Captains of the United States included Harry Manning, Roy Edward Fiddler, John Anderson and Leroy J. Alexanderson. Inspired by the exemplary service of the British liners RMS Queen Mary and Queen Elizabeth, which transported hundreds of thousands of U.S. troops to Europe during the Second World War, the federal government of the United States decided to sponsor construction of a large and very fast vessel that would be capable of transporting large numbers of soldiers. Designed by renowned American naval architect and marine engineer William Francis Gibbs, the liner's construction was a joint effort between the United States Navy and United States Lines. The U.S. government underwrote $50 million of the $78 million construction cost, with the ship's operators, United States Lines, contributing the remaining $28 million. In exchange, the ship was designed to be easily converted in times of war to a troopship with a capacity of 15,000 troops, or a hospital ship. The vessel was constructed from 1950-1952 at the Newport News Shipbuilding and Drydock Company in Newport News, Virginia. The keel was laid and the hull was constructed in a graving dock. United States was built to exacting Navy specifications, which required the ship be heavily compartmentalized and have separate engine rooms to optimize war-time survival. To minimize the risk of fire, the designers of United States used no wood in the ship's framing, accessories, decorations or interior surfaces. 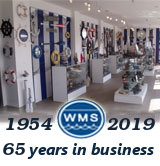 Fittings, including all furniture and fabrics, were custom made in glass, metal and spun glass fiber to ensure compliance with fireproofing guidelines set by the U.S. Navy. Though the galley did feature butcher block, the clothes hangers in the luxury cabins were aluminum. The ballroom's grand piano was of a rare, fire-resistant wood species, though originally specified in aluminum — and accepted only after a demonstration in which gasoline was poured upon the wood and ignited, without the wood itself igniting. The construction of the ship's superstructure involved the largest use of aluminum in any construction project to that time, and presented a challenge to the builders in joining the aluminum structure to the steel decks below. The significant use of aluminum provided extreme weight savings. At 105 feet (32 m) beam, United States was built to Panamax capacity, ensuring the ship could clear the Panama Canal locks with just 2 feet (0.6 m) to spare on either side. United States had the most powerful steam turbine in a merchant marine vessel. The ship was capable of steaming astern at over 20 kn (23 mph; 37 km/h), and could carry enough fuel and stores to steam non-stop for over 10000 nautical miles (12,000 mi; 19,000 km).